Flogging (see my last post) wasn’t the only way that the nineteenth-century army left permanent marks upon soldiers bodies. It is shocking to today’s sensibilities, but miscreant soldiers were branded. Or, to be technical, forcibly tattooed. 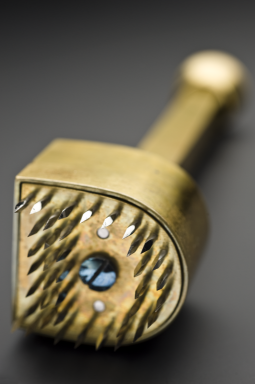 Men had been branded with a hot iron in the seventeenth century, as this artifact from the reign of Charles I shows. Some shades of political opinion were revolted by the practice of branding. It implied that free men, volunteer soldiers, were akin to cattle. 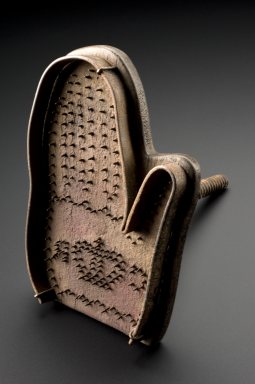 6 It also echoed practices of slave ownership, where human chattels were marked with an owner’s brand. Yet public opinion was not particularly exercised by the issue of branding, compared to its opposition to flogging. Of course, branding was also strongly associated with criminality. Until 1789, a convicted criminal could be branded on the thumb with ‘T’ for theft, ‘F’ for felon or ‘M’ for murder. 7 While the parallels between criminal and military punishment outraged public opinion in the case of flogging, branding did not arouse the same feelings. Politicians expressed surprise that branding even existed, suggesting that awareness of it was relatively low. 8 Being a shorter and necessarily quieter punishment than flogging, civilians were unlikely to hear the cries of soldiers being marked. It may be that the earlier cessation of branding in a criminal context meant that it quickly fell from public knowledge. However, flogging endured as a criminal punishment until the early 1830s, 9 which may explain greater public revulsion to it as a military punishment in the nineteenth century. Branding was finally abolished in 1879, just before flogging in 1881. This entry was posted in Barracks, Britain, Court Martial, Flogging, History, Ireland, Military, Punishment, Slavery, Tattoo. Bookmark the permalink.